Finally! A great hip-hop album of a greatness we haven't had in this list for a long while. 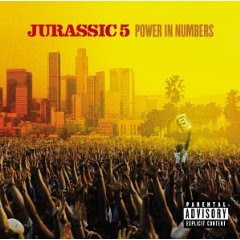 Jurassic five do none of the things that mainstream hip-hop was doing at the time and this is really what makes the album so good. The album is fun and funky, intelligent, well written, extremely well sampled, the rhythms work perfectly and has an eclecticism missing from much of their contemporaries. So eclectic in fact that this album manages to guest star Nelly Furtado and do it pretty well in a great track. Jurassic 5 are not unselfconscious as to what they are doing, in fact one track "One of Them" directly addresses the stupidity of Gangsta Rap. This actually harks back to bands like De La Soul, Jungle Brothers and A Tribe Called Quest, in its playful, smart brilliance. Highly Recommended. The album features a number of differing song styles. One track, "React", composed by Jurassic 5 DJ Cut Chemist, is sample-based and contains no raps. "Acetate Prophets" has the same structure, but is much longer and also features production from Jurassic 5's other DJ, DJ Nu-Mark. Many tracks start or end with a sample of speech, usually inserted by Cut Chemist. The track "DDT" is an a cappella track rapped by renowned underground emcee Kool Keith, featuring no raps by Jurassic 5 themselves. The chorus of "What's Golden" features a sample from "Prophets of Rage" by Public Enemy.